in various Government Schools of Delhi. This recruitment is completely contract basis only. Eligible criteria having CTET qualified candidates can submit applications online @www.edudel.nic.in on or before 31-01-2018 up to 06:00 Pm. The selection for Delhi Government Schools PGT/TGT Recruitment 2017 will be held based on marks secured in CBSE CTET and other educational qualifications. A merit list will be prepared based on CTET marks and qualifying exam marks, previous experience. Those candidates only called for interview or certificate verification. For more information regarding this Directorate of Education recruitment of DELHI Post/Trained Graduate Teacher (Urdu/Punjabi) eligibility criteria, vacancy details an more data is given below. Notification of Delhi Government Schools PGT/TGT Recruitment. There are 9232 number of vacancies of PGT/TGT posts available in Delhi Government Schools. Subject wise vacancies of PGT/TGT posts are given below. For PGT posts candidate should have completed Post Graduation with B.Ed. For TGT posts Candidates should have qualified B.Ed in relevant subject and CTET-Combined Teacher Eligibility Test conducted by CBSE. The candidate's age limits for Trained Graduate Teacher (Urdu/Punjabi) posts General upper age limit is 30 years, and for the reserved candidates and female candidates of all categories upper age limit is 40 years. For PGT Computer Science/Music Teacher/Drawing Teacher and Domestic Science Teacher upper age limit is 30 Years. Selection for this DELHI Govt Schools Guest Trained Graduate Teacher (Urdu/Punjabi) recruitment will be held based on CTET score, Marks percentage in qualifying exams. Based on these data a merit list will be prepared. And those candidates only called for the Interview or Certificate verification. Merit List will be displayed on official website of Delhi Education department @www.edudel.nic.in as on 23-June-2017. For miscellaneous teachers CTET is not required. Candidates have to submit the application form through online using official website of Delhi Directorate of education @www.edudel.nic.in on or before 15-06-2017. Candidate use the Internet Explorer browser only for submitting the application form. Before applying read the official notifications and instructions of application form submission. 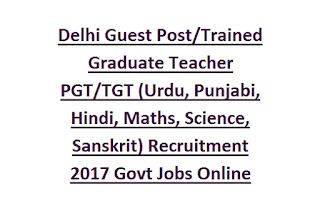 Click here to apply online for the Directorate of Education Delhi Guest Trained Graduate Teacher (Urdu/Punjabi) Recruitment 2017. 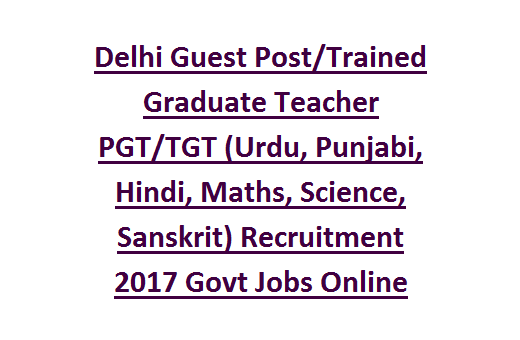 Please share this Delhi Post/Trained Graduate Teacher (Maths/Science/Urdu/Punjabi) Recruitment 2017 via FB or G+.